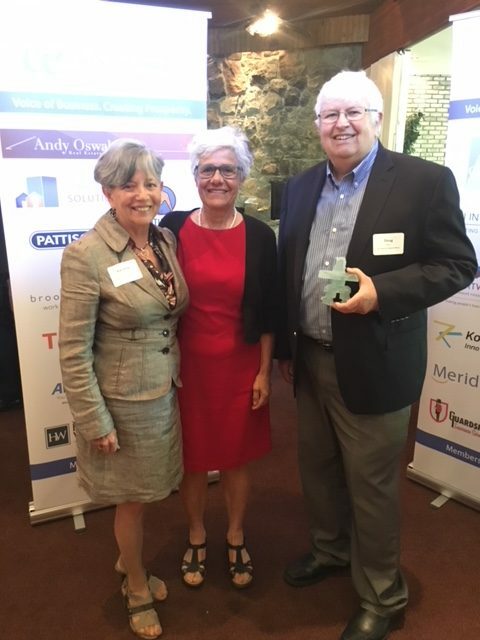 The Boomer Market and the impact of the increasing spending power of a rapidly aging population on business was the hot topic at the West Ottawa Board of Trade’s recent “Business over Breakfast” meeting. “Seniors in Ottawa are the fastest growing age group with significant power that can no longer be ignored”, said Doug Norris, one of Canada’s leading experts on the Census and author of the report “Tapping into Ottawa’s older consumer market: worth 12. 6B and growing”. The report was commissioned by the Council on Aging of Ottawa. Caroline Midgley, member of the Council on Aging’s Capital Aging Advisory Group and Director of Marketing for Seniors on Site, joined Louis Plouffe panelist and outgoing chair of the Council’s Age Friendly Ottawa Steering Committee and keynote speaker Doug Norris at the breakfast. The report dives into the demographic profile of Ottawa’s aging population based on the 2016 Census and explores the needs of the older consumer market in Ottawa and what businesses can do to market and serve this booming market better. The report is available at https://coaottawa.ca/capital-aging-special-report-2018/.